PeopleSoft | Spyre Solutions, Inc.
Spyre Solutions provides planning, implementation, upgrade, optimization, and governance/compliance services for your PeopleSoft Applications. Spyre Solutions has an unparalleled and proven experience with implementing PeopleSoft business solutions. Our success record is 100% with every single project and we are the largest boutique PeopleSoft Consulting organization in Canada. Our core values are based on integrity, quality and experience of our consultants, innovative ways to meet our client’s business requirements, shortened project timelines and reduced project risks. Additionally, our goal is to lower your overall ROI and we accomplish it by (i) simplification of your environment through the elimination of customizations and (ii) ensuring the absolute best value for your consulting resources. W ith comprehensive domain knowledge of PeopleSoft applications, Spyre Solutions facilitates effective decision making, and enables customers to meet their business requirements with a focus on quality, knowledge transfer, process simplification and elimination of customizations. Why Upgrade to PeopleSoft Enterprise 9.2? PeopleSoft 9.2 has new features and functionality designed to help users work more efficiently, get their work done quicker, and in a way that’s more familiar based on consumer technologies. Dramatic improvements in operational cost management. New features like pivot grids, enhanced mobile integration options as well as the improved functions and usability in several modules (e.g. 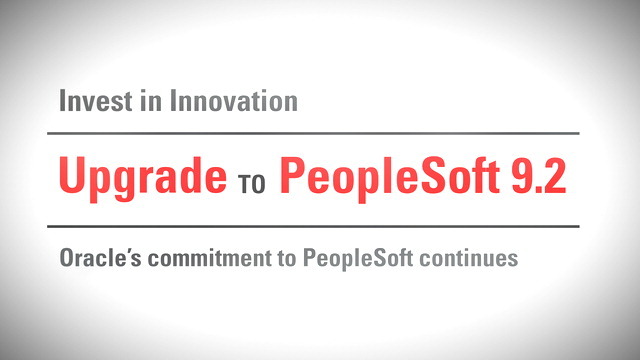 Recruiting) will enable our HR users and employees to improve the overall experience with PeopleSoft 9.2. PeopleSoft 9.2 brings overall usability, recruiting, and other talent management functions to the next level. Together with Oracle’s PeopleTools 8.53, Oracle’s Secure Enterprise Search, and the PeopleSoft interaction hub enhancements, your executives, managers, and employees will be able to get the right data at the right time. Our upgrade service provides a rapid and cost-effective upgrade to PeopleSoft Enterprise 9.2. Lab approach, or on site.. your choice! Totally customizable solution. Add fit/gap, technical assistance, reapplication of customizations and more. Through our deep understanding of 9.2, we can frequently introduce significant improvements to your business processes. We have developed re-usable test scripts to test the standard PeopleSoft business processes. Our experience and confidence allow us to perform upgrades for a Fixed Price, including reapplication of customizations, reporting for the clients that prefer this approach. On call support, including post go live support to keep you up and running! At Spyre Solutions, our approach to PeopleSoft upgrades is proven. By combining our on-shore remote lab capabilities to execute technical upgrades with our experienced on-site upgrade teams, our clients reduce upgrade risk and the cost.